Try a delicious cranberry along with a mouth-watering raisin. Our cran rasin mix, which you may recognize from Fresh Choice restaurants, goes great in salads or for snacking right out of the bag. Net wt. 17 oz. 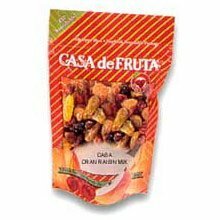 If you have any questions about this product by Casa Fruit Snacks, contact us by completing and submitting the form below. If you are looking for a specif part number, please include it with your message.